Three years after its inception, controversial socio-political website The Temasek Review (TR) will be shutting down in the second half of this year. In an exclusive email interview with Yahoo! 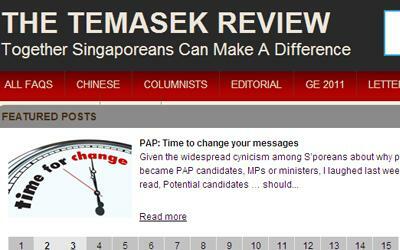 Singapore, editor Amanda Tan said that the editorial team of seven made the decision partly because of uncertainty over funding for the site, which is not for profit and runs on donations. "TR's popularity has exceeded all our expectations, and with increased readership demands for hardware rises, and it would reach a level which the TR team can no longer comfortably afford," she said. TR now has 5,000 unique visitors per day with 100,000 page views. "TR was never meant to 'live' forever. It was set up to help cultivate political awareness among fellow Singaporeans and we felt that we have achieved that," said Tan. "We have started the ball rolling and it is time we work on getting back our lives and spending more time with our family," she said. Since it was started in 2009, the site has made waves online with its famous -- or infamous -- reports critical of Singapore's ruling People's Action Party. Last year, Singapore's state investment company, Temasek Holdings, asked the website to change its name, claiming TR was trying to capitalise on the goodwill and reputation linked to the name "Temasek Review". Tan stressed that there was no "external influence" pressuring them to close the site, which has garnered a reputation for being stridently anti-government. Claiming TR is "not against any institution or anyone in particular", she said, "We really do not believe that the government is all out to shut us down because with their vast resources, they would already have done so if they had wanted to." Noting that the closure — which will take place after they resolve all matters to do with TR Debit Card orders — is "a question of when, not if", Tan said, "The sale of our domain and donations did in a way help keep the site alive, but what about next year, the year after and so forth?" Tan added, "It is indeed a difficult decision for our team of seven, but we realised that inevitably it is a path we have to take, and (we have to) learn to move on." Recently, the team has been dropping hints of an impending closure. In a post this month, Tan urged those involved with TR to buy its debit card and "own a 'piece' of history when TR is no more". Did last year's reports that general practitioner Joseph Ong was TR's founder influence the team's decision? No, said Tan. "When we took over, it was a fresh team." Ong told the media he was involved with the site from 2007 but had stopped in 2009. While Tan said there is a possibility for the site to be handed over to a "new dedicated team", it would be "difficult to find a team we can trust". In October 2010, the TR domain was sold to a business woman. If a new team is not found, the buyer would likely sell the domain name, said Tan. Will the team finally reveal itself? "We will be meeting up for Christmas and surely pictures will be taken. If anyone of us gets too drunk, we might "accidentally" email some to The Online Citizen," Tan quipped. While it is still early days, it is unlikely the team will get together again to start another TR-type project, said Tan. She said, the team hopes for other online sites to "carry on such spirit of citizen journalism" in Singapore. "Such citizen journalism augments Singapore's mainstream media to provide an overall balanced coverage to Singaporeans. In this way, the society moves forward as a whole." A loss for the blogosphere? Professor Ang Peng Hwa, acting head for the division of journalism and publishing in Nanyang Technological University, said this is "definitely a loss for the blogsphere and also for critical discourse in Singapore". "I personally don't agree with many of the comments made in TR, but I think it's an outlet for ideas worth talking about," he said, wondering also if the team has lost its "passion". Founder and editor of commentary website New Asia Republic Donaldson Tan said the website will be "greatly missed". Its anonymity allows the site to play an important role in covering controversial news stories but also constraints its ability to raise money from the public, he noted. "It would easily cost at least $500/month to run a web server with very high bandwidth and DDOS protection," said Tan, who suggested TR consider downgrading its internet infrastructure after the General Election rather than shutting down. Tan said that there may be bloggers aspiring to "fill the big shoes" of TR but they would lack the site's organisation. "It take years to fine-tune the operation run by voluntary bloggers, to build a reputation and to achieve the level of online popularity Temasek Review has achieved." He urged for TR to continue operations at least until GE 2011-12 is over.